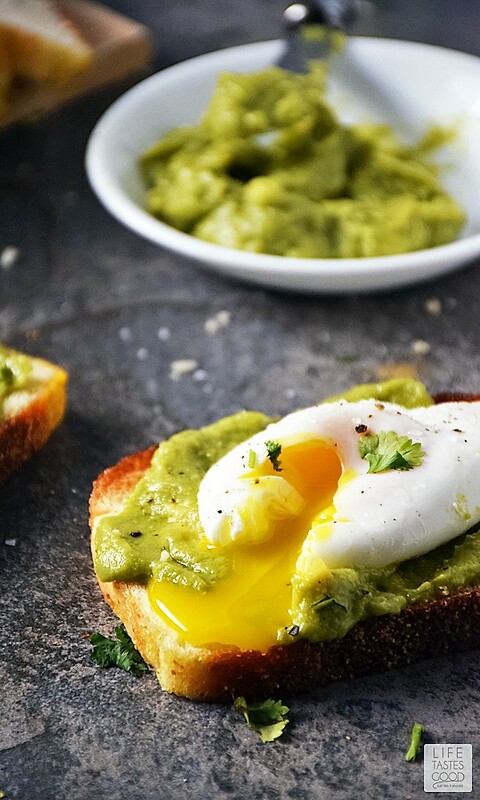 A Poached Egg on Toast is a healthy breakfast full of protein to keep you going all morning long! Oh, and it just so happens to be easy to make and delicious too! Read more to learn how to make perfectly poached eggs. You'll be surprised at how easy it is! 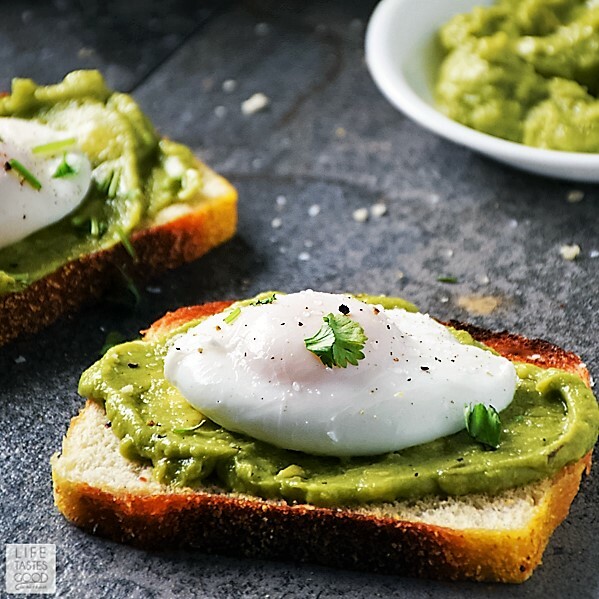 Eggs and avocados go perfectly together, and seeing as my favorite way to eat avocados is smushed up into yummy, garlicky guacamole, why not unite the two for breakfast?!! No reason! Do you know how to poach an egg? It's quick and easy as long as you follow some simple rules. Give it a try and you'll be poaching eggs all the time! It is my favorite way to eat an egg!! Drain the eggs! I use a fine mesh strainer to drain my eggs whenever I poach or fry them. The thin part of the white does nothing for you, other than makes poaching eggs more challenging, so get rid of it! Strainers are inexpensive, yet invaluable in the kitchen. Click on the link above to pick up one just like I use for under $10! Put 2-3 inches of water into a sauce pan and bring to a gentle boil over medium heat. Crack 1 egg into fine mesh strainer set over a shallow dish and allow the thin part of the white to drain. Prepare a paper towel lined plate to have ready when your egg is done. Always good to be prepared! When the egg has drained, gently lower it into the sauce pan of gently boiling water. Set your timer for 3 minutes and walk away. Because we drained the egg, there is no need to swirl to try to get the thin part of the white to wrap around the egg (which rarely works anyway and results in a messy looking poached egg). 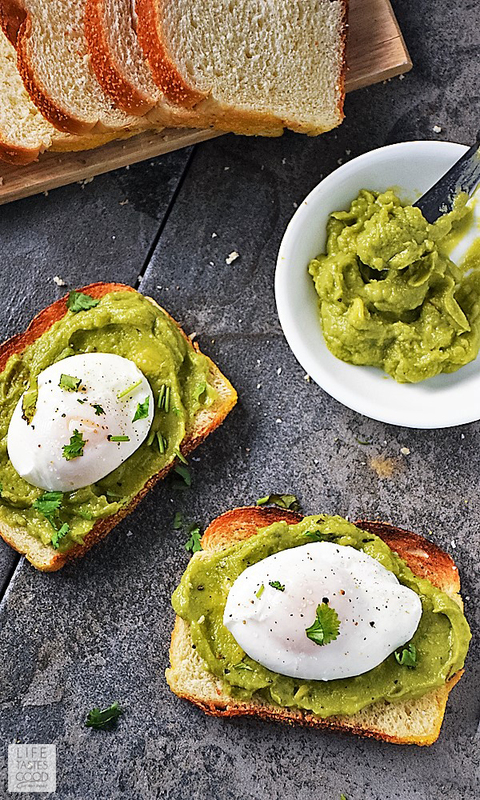 While the egg is poaching, prepare the toast and top with guacamole as desired. No guacamole? No problem! You can butter the bread or leave it dry. It's up to you! Tip: If you don't want to make my Simple Guacamole I linked above for you, I recommend using Wholly Guacamole brand. When I can't get good avocados for my guac, this is the brand I use. I have tried others, but so far, Wholly Guacamole is the only brand I feel is most like homemade. When the timer goes off, use a slotted spoon to gently remove the egg from the water onto the paper towel lined plate. Blot gently to dry. Gently place the egg atop the guacamole toast. Salt and pepper to taste and garnish with freshly chopped cilantro. Enjoy! Marion! A Beautiful Composition of complimentary flavors! This one is Perfect for a Brand New kind of Breakfast! Well done! I have seen the trick of using a strainer before, so it must good. Your eggs look perfect. Great healthy recipe. Thanks, Penny! I started straining fried eggs for photography purposes and found it to be more appetizing when eating them too, so it just made sense to get rid of that thin white for poaching. I was so pleased when it worked so well because we LOVE poached eggs! Thanks for stopping by today and have a great week!